"The deeper you go, the weirder life gets." 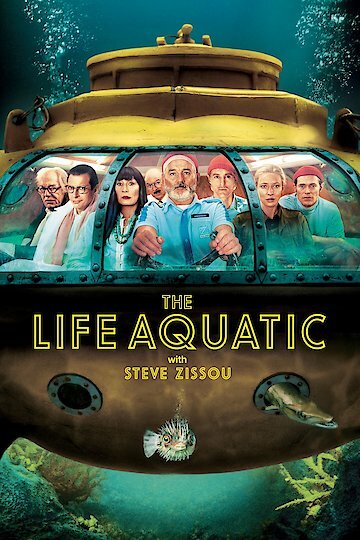 In The Life Aquatic with Steve Zissou director Wes Anderson creates a quirky comedy that plays with the design sensibilities of the 1970s and the allure of Jacques Cousteau's voyages underwater. Bill Murray plays the titular lead, an egotistical marine biologist who has fallen upon hard times. Owen Wilson plays the naive and idealistic man who might be his son, and who is desperately searching for a father figure in his life. Together with a colorful crew of characters the two men set off on a journey in search of a rare shark. The journey becomes increasingly perilous as they experience equipment malfunctions and engage in increasingly illegal acts of maritime crime, but Steve Zissou pushes on like a vengeful Captain Ahab. As the excursion sinks into deeper disrepair, the voyage becomes less about the search for the shark itself and more about the relationships and promises shared between family. The Life Aquatic with Steve Zissou is currently available to watch and stream, buy on demand at Amazon, Vudu, FandangoNow, iTunes, YouTube VOD online.